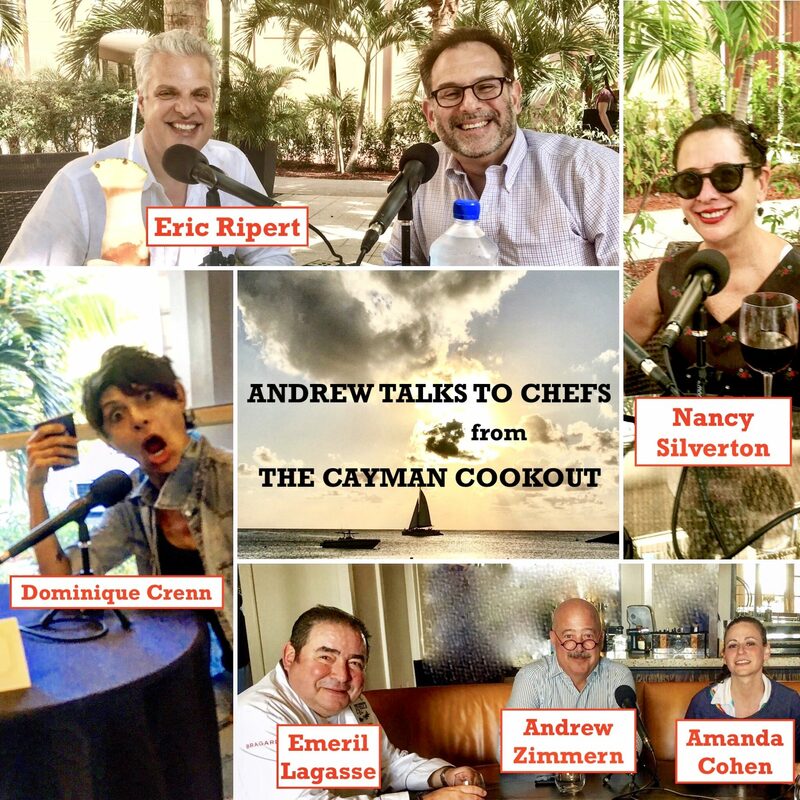 EPISODE 70 Eric Ripert, Dominique Crenn, Emeril Lagasse, Amanda Cohen, Andrew Zimmern & Nancy Silverton–from the Cayman Cookout 2019! Good day, from the 11th Annual Cayman Cookout. In this star-studded, revelation-packed, 4-interview compilation recorded at the Ritz-Carlton Grand Cayman, some of the most celebrated chefs on the planet join Andrew for intimate conversations: Le Bernardin’s Eric Ripert talks about how practicing Buddhism and living in New York City have affected him as a chef; Dominique Crenn shares details of her tomboy youth, including her willingness to take on bullies, by force when necessary; Emeril Lagasse, Amanda Cohen & Andrew Zimmern trade shop talk on the relative value of lawyers vs. agents, how to spot a bad business deal, and the importance of putting food in cultural & historical context; and Nancy Silverton takes us through her storied career, from her early days in 1970s California, to two new projects planned for 2019 & 2020. And it all takes place against a majestic setting worthy of a James Bond movie. Pour yourself some rum and enjoy! Here’s a thought: If you like what you hear, please tell your chef-fascinated friends, subscribe to Andrew Talks to Chefs (it’s free) on iTunes or Stitcher, follow us on your favorite social media platforms @ChefPodcast, and/or rate or review us on Apple’s podcast store. Thanks for listening!